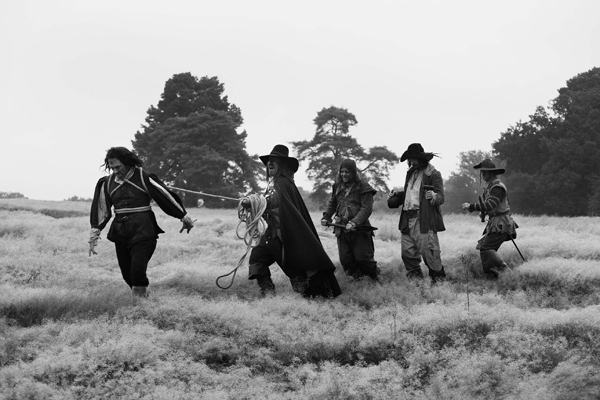 Ben Wheatley’s A Field in England is, at once, the most exciting and the most perplexing film that he has made so far. That is saying quite a lot. It is a period piece set during the 17th-Century, while England is in the midst of a Civil War, but defining it as a “period piece” seems almost crude. It is so far removed from the films often associated with that stuffy genre, residing much closer to the mystical movies helmed by Spanish director Alejandro Jodorowsky. It is a cult film in the making, with its pleasures largely derived from the sheer mind-trip opacity of the direction—the film, much like Wheatley’s other work, takes us in one direction and then throws us in another. 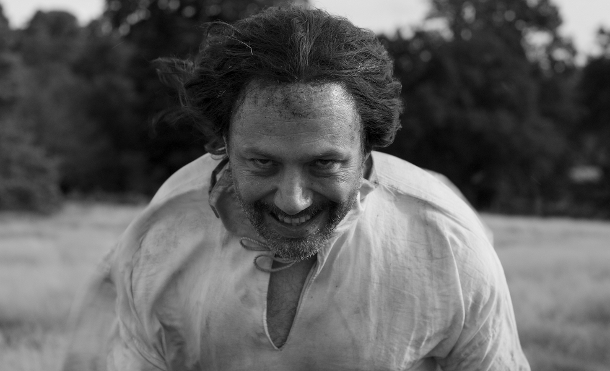 Whitehead (Reece Shearsmith) is an alchemist’s assistant who meets up with three other travelers after fleeing his master during battle. The travelers—Cutler (Ryan Pope), Jacob (Peter Ferdinando), and Friend (Richard Glover)—are on a search for the nearest ale-house. Eventually, however, the group comes across a sinister man named O’Neil (Michael Smiley), who holds them captive and forces them to find a treasure in the eponymous field. The twist in all of this is that the field is full of hallucinogenic mushrooms, and O’Neil uses them to control the men while they dig. The plot, at least in writing, seems relatively easy to grasp, but Wheatley adds an excess of psychedelic flourishes to keep the viewers in as much of a daze as the characters. The film can be obscure to the point of bewilderment, but that is mainly why it works. Wheatley, just like in his masterpiece Kill List, does not expect the audience to connect every dot together. The joy to be had while watching this is to simply ride along with Wheatley, even if some of the ideas will remain locked inside the director’s mind. It is enough, in this case, to enjoy the pure auteur vision at work. And what a vision it is—the film is shot in gorgeously lush black and white and contains some of the most impressive and understated effects seen in any recent film. From the sun slowly being blotched out into black, to the plot halting at random in order for the characters to hold poses that convey their psychological states, to the flurry of whirling and spinning editing that washes over the screen during the men’s mushroom trip (which, surely, has to rank as one of the most impressive drug sequences of all time). Wheatley uses more classical techniques in his editing, which is part of the reason his film looks like nothing else out there right now. The visual aspects of this film are simply stunning. That is not, however, to be flippant about the metaphysical aspirations at play here. This is a film with a dark heart beating at the center, and its concern with human nature is part of what lifts above standard midnight-movie fare. This keeps in line with all of Wheatley’s work, which is too frequently reduced down to violence and incomprehensibility by critics. The point of Wheatley’s work, if there is an overarching one, is to use his, clearly vast, knowledge of genre films to explore the outer limits of these films and their relation to audience expectations. “Kill List” is a hitman film, but it isn’t just a hitman film, just as “Sightseers” isn’t just a comedy and “A Field in England” isn’t just a period piece. They are all very dark and visceral exercises in movie subversion and have a whole lot to say about humanity. Dismissing Wheatley as a director who solely relies on violence and confusion would also be dismissing an important and major talent. Editor’s note: As you may have noticed from the byline, we are excited to add Sam Tunningley to our writing team with this post. He will be contributing reviews and other posts occasionally. You can read more about him on the Writers page. This entry was posted in Reviews and tagged A Field in England, Ben Wheatley, Best films of 2013, Period dramas, Sam Tunningley by samtunningley. Bookmark the permalink. I am a lover of film and music. Typically, my entries will focus on analyzing, critiquing, and rhapsodizing these subject areas.